You can select the format that suits your needs best. All formats are generated from the same source code and have the exact same information. The last entry is direct access to the complete manuals on-line using Pure HTML format. The WinHELP and Compiled HTML format files are designed to be placed in the same directory (plbwin.9?\code). The pure HTML format should be placed in a folder with each product as a sub-folder. For instance, if the root folder is "help", the Language Reference should be in "help\plb". The correct folder names of the Language Reference, Runtime Errors, Designer, Utilities, Application Server, Sunaccess, and Sunbelt Data Manager are "plb", "plbrun", "plbdsign", "plbutil", "plbcs", "sunacc", and "sundm" respectively. PL/B Language Reference - April 18, 2019 - Version 10.1 - 2.65 MB. PL/B Runtime Reference - April 18, 2019 - Version 10.1 - 230.76 KB. 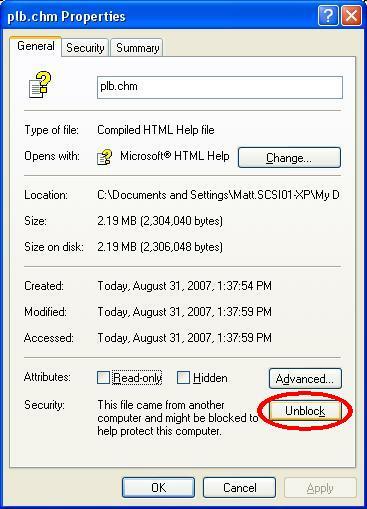 Be sure to UNBLOCK the content after downloading. Right click on chm and select properties, then click UNBLOCK. Click here for image. PL/B Language Reference - April 18, 2019 - Version 10.1 - 3.16 MB. PL/B Runtime Reference - April 18, 2019 - Version 10.1 - 407.24 KB. PL/B Language Reference - April 18, 2019 - Version 10.1 - 6.47 MB. PL/B Runtime Reference - April 18, 2019 - Version 9.9- 894.99 KB. Due to new restrictions in the Java Runtime, you may need to add site exception for these page to display properly. and enter "http://www.sunbelt-plb.com". You also must use Internet Explorer.